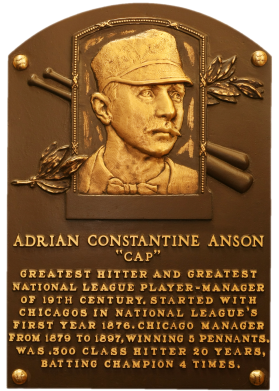 A baseball pioneer, as player, manager, and part-owner of NL Chicago, "Pop" Anson was the game's most influential figure in the 19th century. He hit .300 or better n 20 consecutive seasons, won five pennants, and is often credited with developing the hit-and-run and other strategies. In 1887 he intimidated organized baseball into banning blacks from playing the game. Comments: On Friday February 11th, 2011 I came across this Anson while searching eBay. I was going through a little bit of a 19th century drought. I contacted the seller and offered up some of my available graded vintage for trade. He called me while I was at LAX waiting for a flight out to Denver. I'm always at an airport, waiting for a flight, usually thinking about cards and browsing chat room posts. He had a cash offer for the card from another buyer at a NJ show but called me back with a trade proposal. We talked, and my phone went dead, but my flight was delayed two hours. I was at the bar drinking beer to kill time. The Stella Artois smelled like old ham with a horrible aftertaste - wierd. The waitress agreed with me and replaced it with many, many tall Budweisers. Next to me was a girl named Candy. We talked. She busted out her machine. Which reminded me - I had a laptop, and I accessed my T-mobile Hotspot account. This allowed the seller and I to finalize an agreement via the net - my D322 Clarke SGC 30 (see Clarke), a '36 WWG Foxx SGC 70 (see Foxx) and cash for this amazing Cap Anson. It was a classic trade that I will forever remember - a perfect story to go with a perfect card. Before this item, I had several other Ansons occupying this spot in the collection - first a 1960 Fleer in Nov 2004, then a 1961 Wrigley Exhibits SGC 70 and finally a 1895 N300 SGC 30 in Feb 2009. After 20 years of collecting, this is my first Cabinet card - love it! With the accompanying story I just don't see myself replacing this again, ever. The legendary Cap Anson is pictured on this item with rounded corners, no creases, minor paper loss, scratch on reverse, and clear overall image. Graded FAIR by SGC. UPDATE: Was following the Heritage Auction ending 08/27/2016 and a SGC 60 closed for $33,460 with juice. Really would have loved the upgrade but couldn't pull the trigger. Here's the auction link. 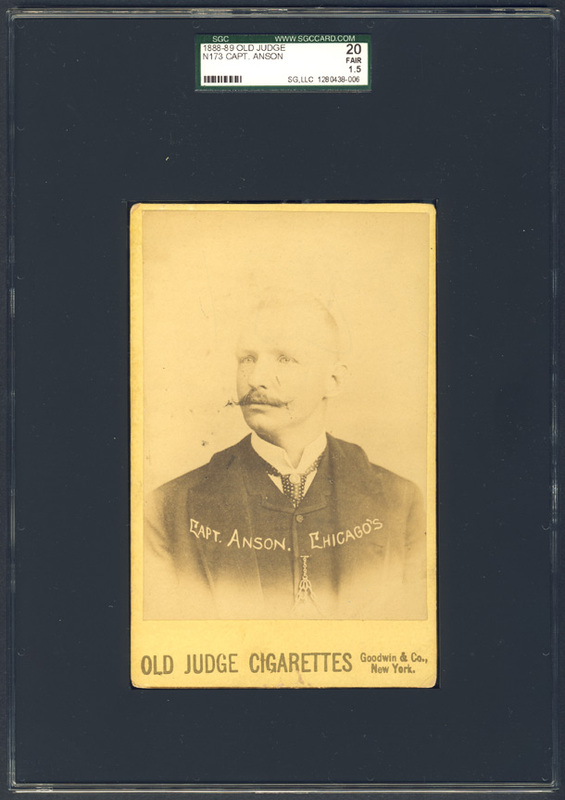 Description: These cabinet cards were issued by Goodwin & Co. in 1888-89 as a premium available by exchanging coupons found in Old Judge or Dogs Head brand cigarettes. 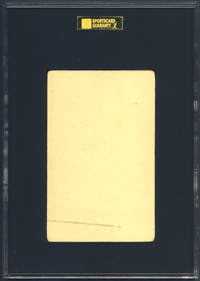 The cabinet cards consist of 3-3/4" X 5-3/4" photographs affixed to a cardboard backing that measures 4-1/4" X 6-1/2". The mounting is usually pale yellow with gold-leaf trimmings, but backings have also been found in red, blue or black. An ad for Old Judge Cigarettes appears along the bottom edge. Cabinets obtained by exchanging coupons from Dogs Head cigarettes include an ad for both Old Judge and Dogs Head, and are scarcer. According to an advertising sheet, cabinets were available of "every prominent player in the National League, Western League, and American Association."